Visitors play an essential role for people in detention. Asylum seekers know only too well that the government and the Department of Immigration do everything to stigmatise them in the eyes of the public. Visiting is a powerful antidote to this, and proves that there are many Australians ready to welcome them to this country and to provide the ordinary human contact they need so badly. Mandatory detention was only introduced in Australia in 1992. Before then, asylum seekers lived freely in the community. Refugees were spared the corrosive anxiety and serious trauma of detention. Society was enriched, and the taxpayer was spared the extraordinary burden of punitive asylum policies. Volunteer visitors didn’t need to come to detention centres, and could devote their time and good-will to other disadvantaged groups in society. For the wellbeing of refugees and for the health of Australian society, it is essential that mandatory detention and other harsh refugee policies be abandoned. It is not a crime to seek asylum and asylum seekers should not be imprisoned. However, both major parties are united in their commitment to detention. We will therefore see no change without a concerted political campaign from the grass roots. Only by raising public awareness and creating public pressure on politicians can we hope for an end to the shocking way asylum seekers are treated. The Refugee Action Coalition (RAC) is a broad-based advocacy group dedicated to campaigning for desperately needed changes to asylum policy. We work tirelessly for refugees, undertaking advocacy in the public arena through information forums, street stalls and public demonstrations, through regular media appearances, and through support for legal remedies like the High Court decision in 2012 that prevented the deportation of many Tamils who were being returned from Australia without any refugee interviews at all. Because we are in regular contact with detainees, we are often the first to blow the whistle on abuses in detention. As some visitors will have seen, RAC occasionally holds demonstrations outside Villawood itself. These are a vital source of hope for the detainees inside. Detainees visited by the many RAC members who are also visitors always say how buoyed they are to see a strong show of public support for them. Unlike private forms of advocacy like lobbying, demonstrations play an important public role in attracting attention and in rallying support for asylum seekers. But giving hope to detainees themselves is their most important role. It goes without saying that our demonstrations are always peaceful. However, SERCO and DIAC don’t like it when we exercise our democratic right to protest, and have occasionally responded by cancelling visiting at Villawood. This is an inexcusable affront to the rights of protesters, detainees, and visitors. Visits must not be used an an instrument of petty retaliation. DIAC’s preparedness to use them in this way is, sadly, characteristic of their attitude to refugees overall. For as long as detention exists, there will be refugees to visit. We all want to see Villawood and the other centres closed so no one has to endure the terrible suffering now imposed on asylum seekers in our name. RAC has no party-political orientation, and campaigns solely on the issue of asylum seekers. 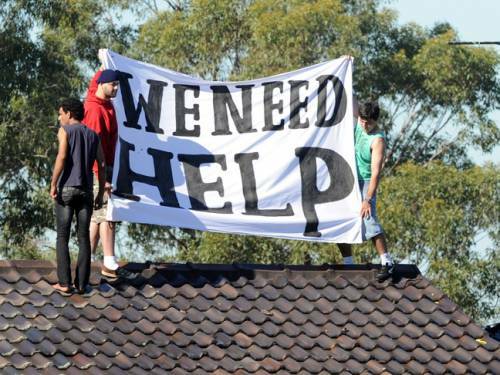 Villawood visitors have much to contribute to the campaign for refugee rights. We encourage you to email us at refugeeactionsyd [at] gmail.com to join our announcement list, which we use to publicize events, and to get involved with our public advocacy for refugees. Contact Petra 0478 009 384 or Ian 0417 275 713.